Objectives: To evaluate outcomes and complications with pediatric living-donor kidney transplant, mostly performed with laparoscopic donor nephrectomy. Materials and Methods: In the 25 years between February 1987 and December 2012, there were 493 children aged ≤ 17 years who received a kidney transplant. Demographic characteristics, graft and patient survival, rejection episodes, and complications were recorded. Analysis was performed for 3 sequential periods (1987-1994, 1995-2002, and 2003-2012). Results: The mean patient age was 13 ± 4 years (age range, 2.5-17 y). There were 290 males (59%). Glomerulonephritis was the most common cause of end-stage renal disease. Preemptive kidney transplant was performed in 412 patients (84%). Donor nephrectomy was performed laparoscopically in 445 patients (90%). The 5-year graft and patient survival were improved from 1987-1994 to 2003-2012. The overall death-censored graft survival was 96% at 1 year, 78% at 5 years, and 66% at 10 years after transplant. The overall patient survival was 96% at 1 year, 83% at 5 years, and 75% at 10 years after transplant. Conclusions: Kidney transplant is available for most pediatric patients and has acceptable graft and patient survivals. Laparoscopic donor nephrectomy improves donor satisfaction and morbidity, and may provide excellent graft outcomes in children. The first pediatric kidney transplants were performed in the 1970s. The number of transplants increased slowly during the 1980s and has been stable since 2000. Most transplant centers report that approximately two-thirds of children and adolescents in ESRD programs have a transplant.4,5 Follow-up studies of survival for 20 years have been published.6,7 We previously presented a randomized controlled study that compared open and laparoscopic donor nephrectomy in children and adults.8,9 The purpose of the present historical cohort study was to evaluate and document our results of pediatric kidney transplant with more patients and longer follow-up (from 1987 to 2012). In this historical cohort study, the medical records of all children aged ≤ 17 years (n = 493 patients) who underwent kidney transplant between February 1987 and December 2012 were reviewed. Demographic characteristics, graft and patient survival, rejection episodes, and surgical and other complications were recorded. Graft and patient survival data were obtained from the Collaborative Transplant Study registry in Heidelberg, Germany, in which all patients had been registered. Analysis was performed for 3 sequential periods (1987-1994, 1995-2002, and 2003-2012). Statistical methods included simple descriptive analysis and Kaplan-Meier method. Statistical significance was defined by P ≤ .05. The study was approved by the Ethical Review Committee of the institute. All protocols conformed with the ethical guidelines of the 1975 Helsinki Declaration. Informed consent was obtained from all subjects. The mean patient age was 13 ± 4 years (age range, 2.5-17 y). There were 290 males (59%). There were 45 patients (9%) aged 3 to 7 years, 177 patients (36%) aged 8 to 12 years, and 271 patients (55%) aged 13 to 17 years. There were 77 patients (16%) from 1987 to 1994; 179 patients (36%) from 1995 to 2002; and 237 patients (48%) from 2003 to 2012. Glomerulonephritis was the most common cause of end-stage renal disease. The most common urologic causes of chronic kidney disease were neurogenic bladder in 16 patients (3.2%), reflux nephropathy in 12 patients (2.4%), urolithiasis in 7 patients (1.4%), and posterior urethral valve in 6 patients (1.2%). Donor nephrectomy was performed laparo-scopically for 445 patients (90%). Vascular anastomosis was performed to the aorta and inferior vena cava in 13 patients (2.6%), and the other patients had anastomosis to the iliac vessels. A Modified Lich-Gregoir technique with ureteral stent insertion for 3 to 4 weeks was performed for ureteral reimplant. Preemptive kidney transplant was performed in 412 patients (84%). Revision transplant was performed in 8 patients. The main immuno-suppressive agents were azathioprine, prednisone, cyclosporine, and mycophenolate mofetil. The most frequent complications were delayed graft function and acute graft rejection (Table 1). Rejection episodes were treated with methylprednisolone, anti-thymocyte globulin, tacrolimus, and basiliximab. The 5-year graft and patient survival were improved from 1987-1994 to 2003-2012 (Figure 1). The overall death-censored graft survival was 96% at 1 year, 78% at 5 years, and 66% at 10 years after transplant. The overall patient survival was 96% at 1 year, 83% at 5 years, and 75% at 10 years after transplant. Death after transplant occurred in 44 patients (9%), most commonly because of sepsis (52%), cardiovascular disease (38%), and malignancy (10%). The 1- and 5-year graft survival was better in patients aged 3 to 7 years than in patients aged 8 to 12 years or in patients aged 13 to 17 years (Figure 2). The incidence of ESRD is 6.9 per million people aged 0 to 4 years and 21.8 per million people aged 15 to 19 years.10 Most of these patients need renal replacement therapy. 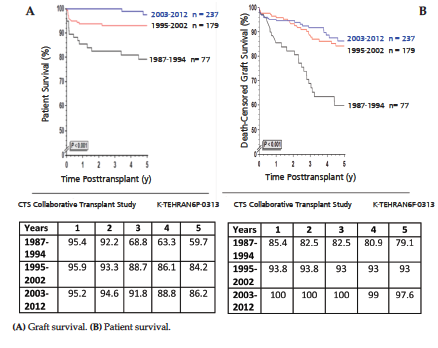 Most studies show a survival advantage for patients who receive transplant than dialysis, and mortality is 7-fold lower in transplant than dialysis patients.11 The present study included data about death-censored graft and patient survival in pediatric kidney transplant recipients (Figure 1). Limited data are available for comparison with Middle East Society for Organ Transplantation countries. A Jordanian retrospective study with 71 pediatric living-related kidney transplant patients aged < 14 years (January 2004 to July 2011) showed that graft survival at 1 year was 95.5%; 3 years was 90.4%; and 5 years was 80.2%. A Saudi Arabian retrospective study of 50 pediatric kidney transplant recipients (1986-2007) showed that 15-year survival was 92% for grafts from living donors. A retrospective study from Egypt in 216 living-related kidney transplants in patients aged < 18 years showed that survival at 1 year was 93%; 5 years was 73%; and 10 years was 48%.12,13 The present study is among the largest single-center series of pediatric kidney transplants reported from a member country of the Middle East Society for Organ Transplantation. In the present study, delayed graft function occurred in 79 recipients (21%) and acute rejection in 59 recipients (15%), comparable with similar studies.4 Very young recipient age was associated with poorer short-term graft survival, probably because of greater technical complexity and higher incidence of vascular thrombosis and acute cellular and vascular rejection in this group.14 The 1- and 5-year graft survival for the present patients were comparable to reported outcomes from the Collaborative Transplant Study registry (Figure 2). Although the present study is a historical cohort and not a randomized study, the large number of patients is evidence that laparoscopic donor nephrectomy can be advised in pediatric kidney transplant. In the present study, we were not able to compare patient and graft survival between transplants with open and laparoscopic donor nephrectomy because most transplants with open nephrectomy were performed during the early experience with pediatric transplant and the number of patients between the 2 groups was not equal. There has been improvement in the use of immunosuppressive drugs, and more recent results may have been improved because of the availability of stronger and safer immunosuppressive drugs. We used azathioprine in earlier transplants, and mycophenolate mofetil was used instead of azathioprine in later transplants. The incidence of overall urologic complications after kidney transplant is 14% to 20%.22,23 Ureteral complications such as ureteral fistula and ureteral stenosis may occur early or late after surgery and may be caused by failure to preserve ureteral blood supply during donor nephrectomy or procurement or imperfect ureterovesical anastomosis. Ureteral fistula was observed in 9 patients in the present study (Table 1); 5 patients were treated nonoperatively, and 4 other patients had open ureteral reimplant. Ureteral stenosis occurred in 8 patients, and all 8 patients were treated with open ureteral reimplant. Lymphoceles observed were perirenal collections of lymph that may have been promoted by division of lymphatic vessels. This complication may be prevented by meticulous dissection and ligation of lymphatic ends during recipient vessel exposure and limiting unnecessary vascular dissection.24 Symptomatic lymphocele may be treated with percutaneous catheter drainage (frequency of success, 50%) or open or laparoscopic drainage with or without marsupialization.25 In the present study, lymphocele was diagnosed in 9 patients, and treatment included nonoperative therapy in 3 asymptomatic patients, open drainage and peritoneal window in 2 patients, and ultrasonography-guided percutaneous drainage in 4 patients. Renal vein thrombosis was noted in 8 transplants (Table 1). Treatment included urgent nephrectomy in 2 patients because of kidney rupture in 1 patient and disseminated intravascular coagulation in 1 patient; in 2 patients, urgent thrombectomy and revision of renal vein anastomosis was performed with successful outcome. There were 2 patients who were treated nonoperatively and had subsequent graft failure. Renal artery stenosis in the transplanted kidney may cause hypertension and graft dysfunction.26 This complication has been reported in 5% to 15% pediatric kidney transplants and should be suspected when there is new-onset hypertension, proteinuria, or increase in serum creatinine level.27 The detection of transplant renal artery stenosis has increased after introduction of new noninvasive diagnostic techniques. In the present study, this complication was detected in 7 patients (1.8%) but may have been undiagnosed in other patients. The most frequent causes of death after kidney transplant include cardiovascular disease (30%-36%), infection (24%-56%), and malignancy (11%-20%).28 The most common causes of death in the present recipients were sepsis (52%), cardiovascular disease (38%), and malignancy (10%). Limitations of the present study included the retrospective study design. In addition, we were not able to compare the results between open and laparoscopic donor nephrectomy because open nephrectomy was performed earlier and the number of patients having open and laparoscopic nephrectomy were not equal. McDonald SP, Craig JC, Australian and New Zealand Paediatric Nephrology Association. Long-term survival of children with end-stage renal disease. N Engl J Med. 2004;350(26):2654-2662. Bartosh SM, Leverson G, Robillard D, Sollinger HW. 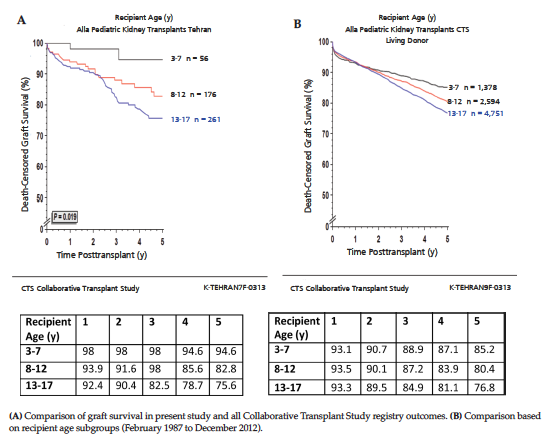 Long-term outcomes in pediatric renal transplant recipients who survive into adulthood. Transplantation. 2003;76(8):1195-1200. Wolfe RA, Ashby VB, Milford EL, et al. Comparison of mortality in all patients on dialysis, patients on dialysis awaiting transplantation, and recipients of a ﬁrst cadaveric transplant. N Engl J Med. 1999;341(23):1725-1730. Rees L, Shroff R, Hutchinson C, Fernando ON, Trompeter RS. Long-term outcome of paediatric renal transplantation: follow-up of 300 children from 1973 to 2000. Nephron Clin Pract. 2007;105(2):c68-c76 . Webb NJ, Johnson R, Postlethwaite RJ. Renal transplantation. Arch Dis Child. 2003;88(10):844-847. Offner G, Hoyer PF, Ehrich JH, Pichlmayr R, Brodehl J. Paediatric aspects of renal transplantation: experience of a single centre. Eur J Pediatr. 1992;151(suppl 1):S16-S22. Englund M, Berg U, Tydén G. A longitudinal study of children who received renal transplants 10-20 years ago. Transplantation. 2003;76(2):311-318. Basiri A, Simforoosh N, Heidari M, Moghaddam SM, Otookesh H. Laparoscopic v open donor nephrectomy for pediatric kidney recipients: preliminary report of a randomized controlled trial. J Endourol. 2007;21(9):1033-1036. Simforoosh N, Basiri A, Tabibi A, Shakhssalim N, Hosseini Moghaddam SM. Comparison of laparoscopic and open donor nephrectomy: a randomized controlled trial. BJU Int. 2005;95(6):851-855. Magee JC, Bucuvalas JC, Farmer DG, Harmon WE, Hulbert-Shearon TE, Mendeloff EN. Pediatric transplantation. Am J Transplant. 2004;4(suppl 9):54-71. Groothoff JW. Long-term outcomes of children with end-stage renal disease. Pediatr Nephrol. 2005;20(7):849-853. Hazza I, Al-Mardini R, Salaita G. Pediatric renal transplantation: Jordan's experience. Saudi J Kidney Dis Transpl. 2013;24(1):157-161. Groothoff JW, Gruppen MP, Offringa M, et al. Mortality and causes of death of end-stage renal disease in children: a Dutch cohort study. Kidney Int. 2002; 61(2):621-629. Seikaly M, Ho PL, Emmett L, Tejani A. 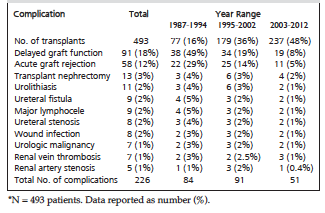 The 12th annual report of the North American Pediatric Renal Transplant Cooperative Study: renal transplantation from 1987 through 1998. Pediatr Transplant. 2001;5(3):215-231. Shapiro R. Living donor kidney transplantation in pediatric recipients. Pediatr Transplant. 2006;10(7):844-850. Mehrabi A, Kashfi A, Tönshoff B, et al. Long-term results of paediatric kidney transplantation at the University of Heidelberg: a 35 year single-centre experience. Nephrol Dial Transplant. 2004;19(suppl 4):iv69-iv74 . Geary DF. Attitudes of pediatric nephrologists to management of end-stage renal disease in infants. J Pediatr. 1998;133(1):154-156. Rizvi SA, Naqvi SA, Hussain Z, et al. Living-related pediatric renal transplants: a single-center experience from a developing country. Pediatr Transplant. 2002;6(2):101-110. Mehrabi A, Wiesel M, Zeier M, et al. Results of renal transplantation using kidneys harvested from living donors at the University of Heidelberg. Nephrol Dial Transplant. 2004;19(suppl 4):iv48-iv54. Singer JS, Ettenger RB, Gore JL, et al. Laparoscopic versus open renal procurement for pediatric recipients of living donor renal transplantation. Am J Transplant. 2005;5(10):2514-2520. Simforoosh N, Bassiri A, Ziaee SA, et al. Laparoscopic versus open live donor nephrectomy: the first randomized clinical trial. Transplant Proc. 2003;35(7):2553-2554. Jungraithmayr TC, Wiesmayr S, Staskewitz A, et al. Five-year outcome in pediatric patients with mycophenolate mofetil-based renal transplantation. Transplantation. 2007;83(7):900-905. Sinha R, Saad A, Marks SD. Prevalence and complications of chronic kidney disease in paediatric renal transplantation: a K/DOQI perspective. Nephrol Dial Transplant. 2010;25(4):1313-1320. El Atat R, Derouiche A, Guellouz S , Gargah T, Lakhoua R, Chebil M. Surgical complications in pediatric and adolescent renal transplantation. Saudi J Kidney Dis Transpl. 2010;21(2):251-257. Sheldon CA, Churchill BM, Khoury AE, McLorie GA. Complications of surgical significance in pediatric renal transplantation. J Pediatr Surg. 1992;27(4):485-490. Waltzer WC, Turner S, Frohnert P, Rapaport FT. Etiology and pathogenesis of hypertension following renal transplantation. Nephron. 1986;42(2):102-109. Fontaine E, Beurton D, Barthelemy Y, Quentel P, Cukier J, Broyer M. Renal artery stenosis following pediatric renal transplantation. Transplant Proc. 1994;26(1):293-294. Harzallah K, Floret D, Martin X, Cochat P. Mortality in pediatric renal transplants: 15 years’ experience [in French]. Arch Pediatr. 2004;11(8):916-920. Jacobs SC, Cho E, Foster C, Liao P, Bartlett ST. Laparoscopic donor nephrectomy: the University of Maryland 6-year experience. J Urol. 2004;171(1):47-51. Acknowledgements: The authors thank Professor Gerhard Opelz (Collaborative Transplant Study coordinator) and his colleagues for their assistance in registration and analysis of data used in this study. The authors have no conflicts of interest to disclose, and there was no funding for this study.